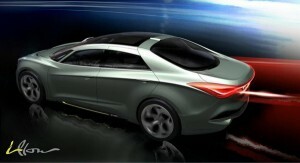 Korean manufacturer has unveiled a teaser picture of the new Hyundai i-flow concept, a concept that will be officially presented to the public at the Geneva Motor Show on March 2, 2010. Hyundai i-Flow Concept is a luxury sedan that will enter the market segment D and presents a design developed by European design team Hyundai in Germany. With a fluid design and built of light materials, Hyundai and-flow concept presents a very aerodynamic look and enjoy advanced recycling energy such as solar cells. More details about the new Hyundai i-flow concept will be published with the official presentation at the Geneva Motor Show.